Jaime Calungsod turned 85 years old yesterday. 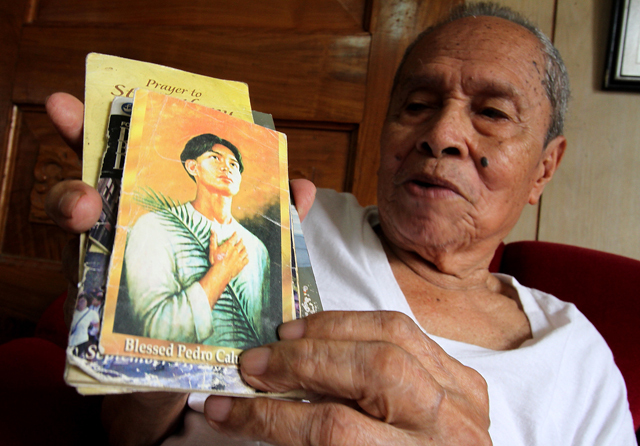 Full of vigor, when most men his age would be lying down in bed complaining of aches and pains, the retired gentleman said he plans to travel to Rome for the Oct. 21 canonization of Visayan martyr Pedro Calungsod. Jaime Calungsod shows a prayer booklet of the young martyr Pedro Calungsod which he uses daily at his home in Poblacion, Ginatilan town. With several families surnamed Calungsod in Ginatilan town, southwest Cebu, Jaime proudly believes he's a descendant or at least a relative of the 17th century teenager who will be officially raised to the altar of sainthood. Jaime, who lives with his son Gilbert in the Poblacion, has a special affinity with the young beatus. He was diagnosed with prostate cancer in 1986 and credits his recovery to prayers to Pedro. “I was a recipient of a miracle,” he told Cebu Daily News. “I kept on praying. Blessed Pedro is from Cebu. I'm related to him,” said Jaime when CDN visited him in his modest bungalow in Ginatilan on Monday. Jaime, a reserve officer of the Philippine Army, said he took medicines prescribed by the doctor but never forgot to call on his “relative” in heaven for help. During a visit to the United States for a checkup, he was pronounced cured according to Jaime and his son Gilbert. To certify a miracle as authentic, the Catholic Church has a long and rigorous procedure of verfication. was in a coma. She suffered from hypoxic encephalopathy or lack of oxygen in the brain, and experienced “rapid recovery” after the doctor sought the intercessarion of Calungsod. Her identity is being closely guarded until a few days before the Oct. 21 rites to protect her privacy and avoid undue sensationalism. Jaime's account, without complete medical documentation and the Vatican's scrutiny, is not a similar case. cause of sainthood of Calungsod, who was looking into accounts of intercession of Blessed Pedro. “I'm very happy. I now have a relative who will proclaimed saint. We will be going to Rome to represent the Calungsod family in Ginatilan,” said Jaime. A cane lay by his side, but Jaime was up and alert. He showed no difficulty getting up and walking with energy to his bedroom to get a prayerbook to show his visitors that he's been a devotee of Calungsod even before the Jesuit missionary helper was beatified in 2000 and givien the title “blessed” by Pope John Paul II. “Everyday before going to bed, I pray to Pedro. I've been asking for good health in my family,” he said showing the image of the boyish martyr. Jaime, has six children, several of them living abroad. When told that his visitors were from CDN, Jaime immediately pointed out that one of the paper's columnists, Ricky Poca, was his student. Poca,who teaches political science in the University of San Carlos, confirmed that Jaime was his commandant in Civilian Army Training in his USC high school days.